Instrumental Play-Along. Play Along. Softcover Audio Online. 16 pages. Published by Hal Leonard (HL.841962). ISBN 0634085689. 9x12 inches. Book/Online Audio. 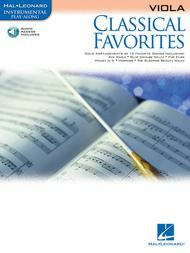 15 classic solos for all instrumentalists. Includes: Ave Maria (Schubert) • Blue Danube Waltz (Strauss, Jr.) • Fur Elise (Beethoven) • Largo (Handel) • Minuet in G (Bach) • Ode to Joy (Beethoven) • Symphony No. 9 in E Minor (From the New World;), Second Movement Excerpt (Dvorak) • and more. January 18, 2010 It Rocks!!! Like I said it rocks!! !